Last year five cornerbacks were taken in the first round. It wasn’t a particularly great class for corners — but it’s quickly becoming a premium position in the NFL. We’re not just seeing the usual 2-3 brilliant tall, athletic corners going in the top-15. Teams are scrambling to address needs here. There’s almost a perfect storm brewing in this draft. The thin options in free agency will put a lot of emphasis on a select group of rookie corners. Those with the length, speed and talent are going to go early — then we’ll possibly see a major drop off. If you want a cornerback you might have to consider taking one in round one. — I have Cleveland trading their two picks in round one to Tennessee for Marcus Mariota for the second mock in a row. There seems to be some validity to this — Mary Kay Cabot touched on the subject this week. The Browns have had such a nondescript off-season and that’s unusual for this owner and for a team still mired in mediocrity. It’s looking increasingly likely that Johnny Manziel isn’t the answer. We know that Josh McCown certainly isn’t. The Titans get two picks to rebuild their defense, the Browns get a quarterback. — I don’t see Leonard Williams dropping to #8 as a big deal. He’s not an elite athlete and didn’t test brilliantly at the combine. It’s still unclear what exactly his best position is at the next level. It’s almost universally received that he’s going to be a top-two pick but let’s not jump to that assumption too quickly. 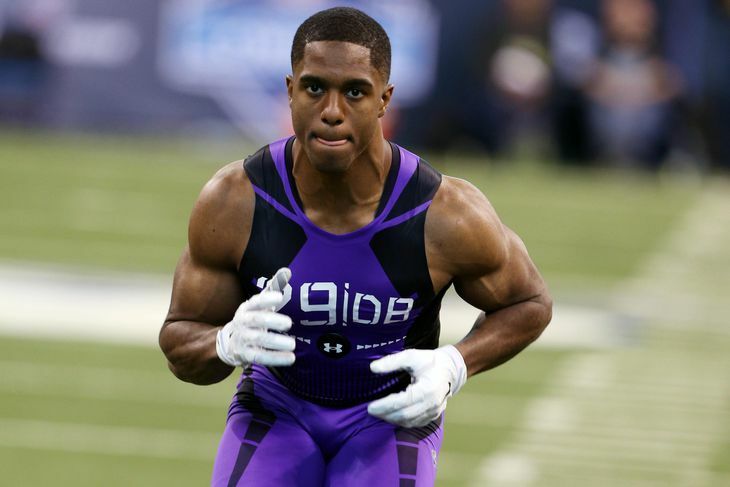 — Byron Jones reportedly ran in the 4.3/4.4 range at the UConn pro-day today. The height, length, speed and overall athleticism is off the charts. It’s hard to imagine he doesn’t go in the top-20. You’re talking about athleticism beyond even Patrick Peterson’s level — and he’s not a bad football player either. — I think there’s a chance another receiver or two finds their way into round one. However, there’s so much depth at the position I think teams will be tempted to wait until the second day, especially when the top three prospects (Cooper, White and Parker) leave the board. For example, it’s going to be harder for the Kansas City Chiefs to find a solid O-line addition or cornerback in round two. It’ll be much easier to find an impact receiver. — I think the following receivers have a shot at going in round two: Perriman, Strong, Dorsett, Lockett, Agholor, D. Smith, Green-Beckham, Coates. If all of these names are still on the board after day one, it could increase the chances of Seattle moving up from #63 using one of their fourth round picks. — There aren’t many key absentees in this first round projection. You might ask about someone like Jake Fisher — but let’s not forget Joel Bitonio was an early second rounder. Fisher and Bitonio had very similar combines and I personally think Bitonio is/was the better player. Will the Seahawks trade up from #63? 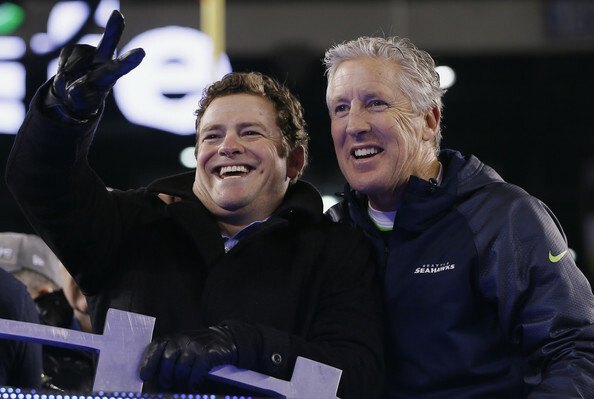 Will John Schneider and Pete Carroll be aggressive to target an impact player in round two? Yesterday I started writing the first draft of a two-round mock. It’ll be on the blog some time this week, with a seven-round Seahawks projection to follow. How good are the options at #63? Well, it depends. There are one or two nice options that we’ve talked about. Ty Sambrailo would be a good fit moving inside to guard or even center. He’s mobile with good footwork, has the kind of size to replace James Carpenter and he’s well suited to the ZBS. Tyler Lockett has the production, grit, kick return skills and ability to consistently get open that should appeal. What if neither player is available? It’s a topic we haven’t really talked about. When I spoke to Tony Pauline a couple of weeks ago he said Sambrailo would be good value in the late second. In a non-direct way he inferred there’s a chance he won’t be there at #63. While many other projections have Sambrailo available in the third or even fourth round, Pauline had him as a late first rounder before a substandard off-season. He doesn’t see a drop into the third. Lockett also has enough appeal to be gone by #63. Unlike Sambrailo his stock is trending upwards. He had a terrific Senior Bowl and matched it with a good combine. With all the records he broke at Kansas State, the bloodlines, the character. With an expected rush on receivers in round two he could be long gone by Seattle’s pick. In the mock I started to put together yesterday both were off the board. The alternatives weren’t great and the value just wasn’t there. Sure, there were options. Some of them risky. We’ll get into those when I publish the mock. It does raise the question of a move up the board. I don’t think we should expect any major, bold moves. The value in the middle rounds is still very good, particularly at Seattle’s positions of need. They can add to the interior offensive line, receiver and possibly corner and the D-line. They have some holes to fill too — especially at guard and center. You’re not going to give away picks to go chasing one player. The Seahawks made their big move when they traded Jimmy Graham. If they’re going to consider moving up it’s probably going to be a small jump to target a specific player. It could even be a Sambrailo or Lockett. It could be one of the other receivers. Yes it’s a rich class, but if you can get an impact player to finally round off the passing game — would you make a deal? While the Seahawks are never going to be a pass happy offense, there’s going to come a time when Marshawn Lynch is no longer there and greater responsibility will be on the teams $100m quarterback. Russell Wilson has never had a bevy of upper echelon targets. He’s been given a group of plucky overachievers. With Jermaine Kearse a free agent in 2016 and no certainty over the future of Paul Richardson, adding another receiver he can grow with over the next 4-6 years could be just as vital as finding a starting center or guard. What receivers could you go up for? Devin Smith, Dorial Green-Beckham, Phillip Dorsett, Nelson Agholor, Tyler Lockett. It really depends what you’re looking to add to the offense. This is where the offensive line depth in this draft becomes a big bonus. You can find a center in the middle rounds — whether it’s Ali Marpet, B.J. Finney, Hronnis Grasu, Andy Gallik or a convert like Mitch Morse or Terry Poole. There are others too. Ditto at guard. You can fill these holes with a third and fourth round pick in this draft. The possibility of adding Chris Myers (as discussed here) or another veteran center also takes some of the pressure off. A rookie could still win the job as we saw with Justin Britt going head-to-head with Eric Winston last year. At least you have the option of a proven commodity like Myers and won’t feel you have to force things in the draft. So what kind of compensation would you be willing to forfeit? With eleven total picks and six between rounds 3-5, you can afford to lose one of the fourth rounders. You’ve got an early selection in that round from New Orleans, your own pick at the back end and then a compensatory selection that can’t be dealt. If you negotiate with teams about moving up 6-12 spots they’ll want the early fourth rounder. In the 2014 draft Philadelphia traded from #54 to #42 with Tennessee for the price of a late fourth round pick. Funnily enough this was to target a receiver (Jordan Matthews). It’s unclear whether Seattle can get that type of value for the price of a fourth rounder — jumping twelve spots is a bit of a gift. Yet the options in that #50-55 range could be a lot more appealing than the options at #63. With the draft trade chart fairly prehistoric these days, the Seahawks could point to a recent precedent for a move like this. And with the perceived value available in the middle rounds this year — a team like Buffalo at #50, Philly at #52 and Carolina at #57 could be a target area. All three teams are likely to consider adding to their interior offensive line in the draft. Acquiring an extra fourth rounder could be intriguing. It’s probably why the Seahawks wouldn’t deal their late third round pick — allowing them to make a trade like this and still ‘jump the queue’ so to speak. It’d create a situation where essentially you gave up the #31 pick and Max Unger for Jimmy Graham and the opportunity to draft a possible impact player in round two. It’s not a bad deal overall, especially if you adequately replace Unger with a cheaper longer term solution (albeit with a possible shorter term veteran fix). You still get to pick twice in the fourth. A move like this could go some way to making the offense in Seattle almost as scary as the historically good defense. Former Texans center Chris Myers is visiting the Seahawks today, per source. Letroy Guion's one-year deal with the #Packers is worth $2.75 M, per league source. I’ll have a new post later today discussing the possibility of Seattle moving up in round two. For the time being I thought I’d leave this here. Guion’s deal in Green Bay is worth $2.75m according to Adam Caplan — so somebody (possibly Seattle) made a decent push to tempt him away. With that option no longer on the table Myers appears to be the next veteran option. Of course, even if he signs he’s no guarantee to make the team. Eric Winston was brought in to compete with Justin Britt a year ago. Britt won the job, Winston was cut. The same could happen at center this year. It could also be a review of the situation with Stefen Wisniewski, which also remains unresolved. We’ve talked about the off-field concerns with Frank Clark and they aren’t going away. You can’t ignore them. He may well have impressed teams during interviews at the combine — but we weren’t privy to those talks. Whoever drafts Clark, there’s going to be a portion of the fan base where this just doesn’t sit comfortably. And that’s totally understandable. By discussing his tape against Northwestern here, we’re not endorsing his character. We’re not saying the Seahawks should draft him. We’re just talking about the football side of this debate. I want to make that clear. With that in mind I’m going to say Clark provides the best possible opportunity to add an impact defensive player after the second round. This is just a masterclass performance against Northwestern. He’s not a speed rusher at 6-3 and 271lbs and he only ran a 4.79 at the combine. Yet he finds ways to make an impact despite a lack of natural quick’s. He plays with a relentless motor, he shifts off blocks and knows when to rush the backfield or to hold position and try to tip a pass. Unlike Danielle Hunter — who seems like a tipped-pass specialist only — Clark gets a handful of TFL’s and splash plays in this game. His ability to change direction is very impressive. He’s a thick, well set player but moves like a much smaller and nimbler athlete. You see that with the rest of his combine workout — a 38.5 inch vertical, a 7.08 three cone and an explosive 4.05 in the short shuttle. He’s never going to round the edge with a pure speed rush and beat NFL tackles. He can drive into the backfield with a nasty bull rush, dodge cut blocks, sell the outside rush before dipping inside and there’s evidence of a productive spin move. He looks like a second round talent with an UDFA character flag. If you trust him — or if you can make yourself believe you can trust him — you’re going to get a guy who can play quickly, will excel against the run and make plays even as a rookie. Look at the way he combats the read option or QB fake — he tracks down the ball carrier with ferocity and has the field IQ to diagnose plays quickly. The Seahawks currently only have Cassius Marsh legitimately backing up Michael Bennett and Cliff Avril. If they want an impact defensive player in this class — Clark could be a solution. With the obvious asterisk of the character and whether you can justify to yourself taking a player with his background. 0:23 — Shows to the outside before swimming inside, shedding the blocker and collapsing the pocket from the edge. Forces the QB to scramble for a short gain. 1:06 — pursues down the line, taking out one blocker and forcing the running back inside into traffic on third down (he doesn’t convert). 2:11 — Read option play. Notices the QB has it very quickly, leaps up and deflects the pass into the air for a near interception. 2:29 — Bull rushes the right tackle into his own quarterback for a big sack on third down. Pure power and he’s taking over the game. 2:50 — Explodes into the backfield and brushes off a terrible attempt at a block by the full back. The QB panics because he’s in his own end zone and throws straight at Clark who blocks his second pass of the game. 3:08 — Another dominating bull rush. He somehow manages to get his arm up to tip his third pass and this time it’s intercepted by a defensive tackle. Sensational play from Clark. 3:48 — Read option. Clark diagnoses that it’s a trick-play end-around and sees it all the way. He destroys the ball carrier, rag-dolling him to the ground for a big loss. 6:30 — Spin move to get away from the tackle, forces the QB to get the pass away too quickly. Incomplete. The right tackle in this game was clearly over-matched but don’t take anything away from Clark’s performance. This was a thoroughly brilliant display. Letroy Guion visits the Seahawks, what does it mean? Seth Katz, Guion’s agent, said Guion won’t be prosecuted, and thus will not face probation or have a criminal record from his Feb. 3 arrest in Starke, Fla.
Guion was pulled over for a failure to maintain a single lane, at which point police found 357 grams of marijuana, a registered gun and $190,028.81 in cash. Guion has maintained the cash came from football paychecks. Katz said Guion reached a plea deal Tuesday in which he paid a $5,000 fine, and as a first-time offender the charges were dismissed. His record will be cleared as a consequence but he could still receive punishment from the league. The Seahawks recently signed Ahtyba Rubin to a one-year contract carrying a $2.5m cap hit. According to Pete Carroll, talks continue with Kevin Williams. They’ve also been linked with the likes of Chris Canty — who re-signed with the Baltimore Ravens. This could just be a review of the draft. Will they focus on receiver, the offensive line and cornerback in rounds 2-5? They’ve had more success adding veteran defensive lineman in free agency and the defensive tackle options in the middle rounds might not provide sufficient value. It could also be a big hint that Brandon Mebane is going to have to lower his salary or face the axe. Mebane was arguably having a career year in 2014 before a hamstring injury ended his season. Mebane’s cap hit is $5.7m in 2015 and he turned 30 in January. It’s the final year of his contract. In comparison, 28-year-old Terrance Knighton signed a deal in Washington with a $4.45m cap hit. With the Seahawks tight against the cap and needing to extend the contracts of Russell Wilson, Bobby Wagner and J.R. Sweezy, Mebane’s salary is a little too rich. Ultimately he can do a Zach Miller and add an extra year to the deal and spread out the hit. It gives him an opportunity to still earn a sizable amount in 2015 and potentially 2016 while staying with the Seahawks. He could, of course, stand his ground and force the team to make a decision. However, he’s not in the best bargaining position as he recovers from a serious hamstring problem. Only two players predate the Carroll/Schneider era on Seattle’s roster — Mebane and Jon Ryan. This regime also gave Mebane his second contract in 2011. He’s been a consistent feature. At the right price I’m sure this wouldn’t be a talking point. At $5.7m it’s a talking point. Simply put, you can find good run stoppers at a cost-effective price. Remember when the media thought Seattle’s run defense would collapse after Mebane went on I.R.? After a tough outing in Kansas City, Bobby Wagner returned and the rest is history. Seattle never played tougher or stouter. They coped with a combination of Kevin Williams and Tony McDaniel. As good as Mebane is, he’s not irreplaceable. You’d rather not lose him — but you’d rather not lose Chris Clemons a year ago. Sometimes it’s just a case of needs must. There’s no guarantee he signs in Seattle. The Packers remain interested and he could take further visits. However, the Seahawks might be able to get Rubin and Guion for the price of Mebane. They’ll save $5m against the cap if they part ways with Mebane and Rubin cost $2.5m in 2015. Two healthy, younger players or one Mebane? It might not come to that of course. They could get both, restructure Mebane and have extremely good depth up front. They could consider cutting Tony McDaniel to save $3m. There are lots of options on the table. Yet it’s Mebane’s contract that appears to be under the greatest threat. It’s also perhaps a further indication that receiver, guard and center will be the draft priorities. Randy Gregory fails a drugs test, is it a big deal? Should a failed drugs test (marijuana) lead to a draft fall for Randy Gregory? 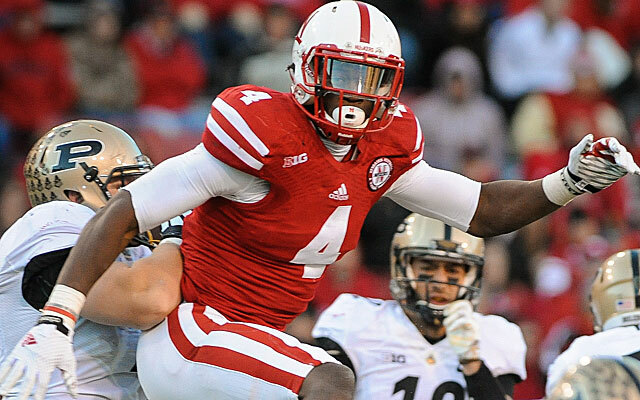 The big news today is that Nebraska linebacker Randy Gregory failed a drugs test at the combine. He tested positive for marijuana. The assumption is this will damage his draft stock. “Plummets” is a poor choice of words. A fall to #13 is hardly a “plummet”. He’s expected to go in the top ten but he’s far from the finished article. A drop into the teens wouldn’t be a shock. Nobody said Brian Orakpo “plummeted” down the board in 2009. He was taken with the #13 pick that year. Brooks makes some fair points on the decision making and potential impact given what was at stake. I would ask, however, whether it’s fair to assume a player isn’t prioritizing football because he smokes pot? Is it as clear cut as that? I understand clubs want their players to be clean, upstanding individuals. Any player who has a serious issue with drugs, well that is rightly going to be an issue. Does Gregory have a major problem? Or does he smoke pot for medicinal reasons? Is it slightly outdated to associate marijuana simply as a problematic substance, rather than a benefit in some cases? What are the facts here? The NFL outlaws marijuana and punishes players severely if they break the rules. That counts if you smoke one joint or one hundred. Fail a drugs test and you’re immediately in stage one of the NFL’s substance abuse program. The league is arguably correct to take a hard-line stance when you consider smoking pot is illegal in most states. Yet if you smoke pot legally in Washington State and are tested as a member of the Seahawks, you are still placed on the substance abuse program. The obvious case to look at is that of Josh Gordan. During the course of his career he’s faced suspensions lasting two games, one season (reduced to ten games) and now one full season. All due to substance abuse. Greg Hardy in comparison is expected to face a six game suspension this year through the NFL’s new personal conduct policy. A district judge in Mecklenburg County found Hardy guilty in July of assaulting and threatening to kill ex-girlfriend Nicole Holder during an early-morning altercation at Hardy’s uptown condo last May. Hardy immediately appealed the decision and was granted a jury trial, which was scheduled to begin Feb. 9. The morning of the trial, however, prosecutors told the judge they were dropping the charges because multiple attempts to find Holder – including setting up surveillance at her new residence – were unsuccessful. District attorney Andrew Murray said Hardy had reached a settlement with Holder for an undisclosed amount to settle any civil claims. The NFL’s new personal conduct policy, approved by owners after Hardy’s conviction, calls for a six-game suspension for first-time violations involving assault, sexual assault and domestic violence. Previously, first-time offenders typically received two-game suspensions. Josh Gordon has so far missed twelve games. By the end of the 2015 season, he’ll have missed 28. Hardy will likely miss six and then return to play for the Dallas Cowboys. In 2013 Seahawks cornerback Walter Thurmond served a four game suspension for violating the league’s substance abuse policy. Prior to the change in personal conduct policy, you would serve half that suspension if you found yourself in a deplorable situation like Hardy’s. That’s a difficult one to explain. Alcohol/prescription painkillers can lead to much worse social and medical issues. Marijuana also helps with anxiety/stress. Let's move on. Sigmund Bloom raises a fair point, whether you agree or not. Is it time for the league to have this discussion? Otherwise the assumption will always be a player like Gregory is a serious character concern, fair or not. “I don’t wake up every day saying, I’d really love to go smoke,” he said. “It’s not a struggle for me every day (now), it really isn’t. In the past, hell yeah, it’s been a struggle. It really has been. Now, I’m focused on my dream. “I want people to really understand that I know I made a mistake, for one,” Gregory said. “That I knew what I had coming up (the combine), and I still made that mistake. That was dumb. “I want people to understand I’m not some dumb jock pothead. I’m not,” he added. “I’m intelligent. I love the people who help me, I love my family, I love my support group. I love football. I love winning. And I don’t want to be labeled as some bust that couldn’t make it because he smoked. And I won’t be labeled as that. 1. Is marijuana such a problem for Gregory that it will have a serious impact on his career? 3. Should he have to quit, or should the NFL adjust it’s stance on marijuana? Ultimately Randy Gregory hasn’t harmed anyone but himself (stock and health). This is something that perhaps needs to be remembered by the 32 NFL teams — some of which entertained the idea of signing Greg Hardy. At what point does sporting success pale into insignificance? There’s a simple explanation to why Hardy has a new contract and Rice remains on the outside. Hardy is one of the premier pass rushers in the NFL playing through his peak years. Rice looked finished even before his headline-making departure from Baltimore. Is it safe to assume if you’re good enough, you’ll get a chance? Whatever the situation? It’ll sit uncomfortably with many fans but it’s hard to know what a team should do. At the end of the day, they’re in the business of winning games. If you can add a player to help you win more games, don’t you have to at least consider it? You’re also in the business of representing thousands of people — a community. You represent fans with families and wives and mothers and sisters. That surely plays a part too? Many teams could afford Hardy’s non-guaranteed prove-it contract, yet only the Cowboys really stepped up to the plate. What is the right decision to make on cases like this? If Hardy was joining the Seahawks instead, it would’ve created a heated discussion among fans for and against the move. The same thing will happen if they draft Dorial Green-Beckham or Frank Clark — the player I want to focus on today. Zierlein wasn’t the only one to believe Clark would go undrafted. Mike Mayock made a similar remark in the build up to the combine while Scouts Inc dropped his grade into the undrafted range. Yet here we are, now discussing the possibility he could go in the top-100 — meaning an early fourth round grade as a possible worse case scenario. Should he get the opportunity? As a fan are you comfortable cheering for a person like this? Or are you willing to offer the second chance? Whether he gets the opportunity or not will probably come down to talent — as appears to be the case with the Hardy and Rice situation. Clark on tape is an absolute dynamo, which indicates he probably will get that second chance — rightly or wrongly. At the combine he ran a 4.79 at 271lbs and a shade under 6-3. It’s not an amazing time but look at the other numbers — a 38.5 inch vertical, a 7.08 in the three cone and an explosive 4.05 in the short shuttle. He’s not a sprinter by any means but that’s elite short area quickness and lower body explosion. Throw in 34.5 inch arms and you’re talking about a guy with the length and quick’s to be a real threat off the edge. He plays with a relentless motor too. It’s easy to forget that Hardy had a whole host of character concerns going into the 2010 draft. He came into the 2009 college season touted as a first round pick. He slipped, Carolina benefited until the point they couldn’t justify keeping him around. Of course, the Panthers weren’t making the decision off the back of the kind of headlines Clark made in 2014. Especially not at a time where Hardy, Rice and Adrian Peterson were causing headaches within the league office and damaging the image of the game worldwide. Someone will give Clark an opportunity. The Seahawks will surely be doing their due diligence the same as everyone else. By now they probably know whether he stays on the draft board or not. Whether you’d be comfortable with the selection or not is a personal decision. He is a very talented football player with a legitimate shot at making it in the NFL. Whether he deserves to get that opportunity or not is another question. It’s an issue the league is yet to truly come to terms with. Since the last time Rob was on the show, the impact of the trade for Jimmy Graham shifts the desire of adding a wide receiver in the early rounds to looking for offensive lineman. Seattle will also have to wait until the second round before making their first selection. Rob talks about how Ty Sambrailo of Colorado State could fill the void at guard if he’s still on the board. The Seahawks recently brought in Stefen Wisniewski as a potential replacement for Max Unger but news has been quiet on the former Oakland center. Rob explains what could possibly be going on behind the scenes. If Wisniewski goes elsewhere, Rob talks about a few other options available in the draft. Are the Seahawks done at receiver? Rob talks about his desire to see the team look toward the draft for a guy the team can develop and be available down the road with a priority toward a player who can contribute in the return game. Kansas State’s Tyler Lockett is a player who is expected to be around in the second round. Finally a look at what the signing of former Browns defensive tackle Ahtyba Rubin means moving forward. We do know they like tackle converts or at least players with experience playing multiple positions. Size and length is attractive but not exclusive. There seems to be a lot more wiggle room on the O-line than other positions. Cable picks his guys and uses a broad canvas. I do think they maintain certain ideals, however. They run a zone blocking scheme with a power element, meaning size is as important as mobility. It’s not a small O-line like you traditionally see in the ZBS. Across the NFL teams are searching for athletic linemen to counter the influx of incredible athletes playing defense in college. Seattle needs to fill two holes at center and left guard. I suspect it’d be counterproductive to move Britt inside. You’d be adding to the upheaval. Instead of two changes to the O-line you’ve got three. If Britt doesn’t work out at guard you wasted a year of development at right tackle and run the risk of a musical-chairs situation up front. Draft a guard. Draft a center. Get to work. The options in this draft class practically encourage that sentiment. You can pinpoint an appealing prospect with every Seahawks pick between rounds 2-5. We’re talking possible week one starters too. After all, Seattle started J.R. Sweezy as a 7th round rookie project in 2012. That didn’t end well but no rookie drafted in this class is likely to face the same level of adjustment (switching from defense to offense in a matter of weeks). At #63 I still believe Colorado State’s Ty Sambrailo makes a ton of sense. When I spoke to Tony Pauline last week he insisted he won’t be available in round three and would provide terrific value in the late second. For me he’s a plug-in-and-play guard for this scheme. He has the size to fill Carpenter’s massive void, the mobility for the ZBS and the desire to get to the second level. He’s not the finished article but he has as much upside for this scheme as anyone in the draft. I suspect the Seahawks like prospects that aren’t considered the finished article — they want room to grow and develop within their setup. Sambrailo fits the bill as an athletic tackle convert. Guard and center are the biggest needs right now — but that doesn’t mean the Seahawks have to go that way with their first pick. I suspect they’ll be enamored with receiver Tyler Lockett. He’s a gritty character guy with superb playmaking ability. He just knows how to get open, consistently makes big plays and has underrated lower body power and spirit. He’s also a week one punt/kick returner — carrying added value. If he’s there at #63 he might be difficult to pass up. That puts the O-line focus on the middle rounds. I think the Seahawks would be quite comfortable in that scenario. Lockett is a terrific player with instant impact potential in the return game. The Seahawks have gone early and often on the O-line since 2012 and yet their biggest success story so far is the 7th rounder spent on Sweezy. A cluster of athletic scheme fits in the mid-to-late rounds open up the possibility of passing on a Sambrailo (for example) at #63, even if it’s an attractive option at the biggest need position. This piece by Zach Whitman for Rotoworld highlights the more athletic linemen in the draft. You can see some familiar names on his list. Ali Marpet is, according to Whitman, the most dynamic athlete among offensive linemen in the 2015 draft. He notes: “If a player is in the 50th percentile, they rate as a perfectly average NFL athlete.” Marpet is in the 96th percentile. He might be raw and untested against top-level college opponents — but he’s a heck of a ball of clay ready to mold. He’s also an ascending talent. The small-school aspect will be off-putting to some and for that reason he maybe lasts a little longer than he should. It equally won’t be a shock if he goes in round two. It might be unlikely, but a double dip of Sambrailo and Marpet would offer a real injection of upside, size and athleticism to Seattle’s interior line. You’d be looking at the most athletic interior in the NFL when you throw Sweezy into the mix. As you run down Whitman’s list you notice Laurence Gibson at #4 — a legit later round option. He has one year of tackle experience at Virginia Tech but exploded at the combine with size, length and athleticism. He’s one to watch for sure as a tackle project — especially if Seattle has to consider moving on from Russell Okung in the future. Rob Crisp is a little further down — a player we’ve talked about a lot since the start of the college season. He’s enormous in terms of length and he’s a plus athlete. For me there’s no reason to think he can’t play left tackle at the next level. He shut down Vic Beasley in a way nobody else did in college football. He’s a tremendous, highly underrated prospect. San Diego State’s Terry Poole tests well and has genuine guard/center size with tackle experience in college (boxes ticked). He’s big but has a nice squat frame. You could easily see him enjoying a long career at guard. Mitch Morse is number five on Whitman’s list. A close friend of Justin Britt, Morse is highly athletic and also has experience at tackle. He has identical size to Max Unger and could kick inside to play center as a fourth round project. Stranger things have happened. He’d also make a nice option at guard. Max Garcia — some don’t like him but I do as a project, did well at Senior Bowl, hit and miss and not the most mobile. You could realistically get Finney, Gallik or Grasu in the middle rounds, with Mason and Garcia available later on. There’s really no reason why any of the first three names cannot start in 2015. Filling spots on the O-line with cheap rookies will be vital as the team manages it’s cap situation and begins to pay more of the storied veterans. You could be paying a second, third or fourth round salary to a starter for the next four years. That’s big. It’s probably one of the main reasons the Seahawks are busy adding veteran defensive line depth having already added Cary Williams and Will Blackmon to the secondary. The best depth and value in rounds 2-5 is going to come on the O-line and at wide receiver. Getting five players at both positions in the middle rounds shouldn’t be ruled out. They’ve got the picks. Quite frankly if they can’t find a couple of guys to fill these two most pressing needs on the O-line, it’ll be an upset. The sheer depth of options and the vast quantity of picks equates to a perfect storm. They select four times between the end of the third and the close of the fourth. Even if neither hole at guard or center is filled at #63 because they’ve taken a prospect like Lockett, they’ll still have many opportunities to feel very good about the situation up front. Meanwhile, it’s only a small update — but we’ll take it. Jim Thomas from the St. Louis Post-Dispatch isn’t expecting any imminent news on Stefen Wisniewski. The Max Unger trade created a new hole in the Seahawks offensive line, putting extra focus on the center position in the draft. There’s still no clear indication on what’s happening with Stefen Wisniewski — but the chances are Seattle will draft a center at some point. And why not? The more you study this class, the more you like. Cameron Erving will likely be the first off the board, possibly as early as the late first round. We could see a bit of a wait after that before a cluster leave the board in rounds 3-4. B.J. Finney is solid, strong at the point but lacks mobility and second level effectiveness. Hroniss Grasu is much more mobile, has the technical quality to start early and seems to be an ideal fit for the ZBS. Ali Marpet is a bit of an unknown given he played college ball at Hobart — but he just looks like a NFL center. Of all the players I’ve watched recently, Boston College’s Andy Gallik might be the best. I still want to watch more. I’ve seen a couple of games for each and none for Marpet (we’ll probably never get any Hobart tape). Gallik just seems to provide a more rounded overall game. He loves to get to the second level and is very effective when he gets there. You can see he has the mobility and footwork to excel in the open space and he can be a punishing blocker. He’s also very strong at the point, doesn’t get pushed around and has the same kind of stoutness you see with Finney. He’s got a really strong lower body — real thickness in the legs and you see that power when he matches up 1v1 and stonewalls against the inside rush. There’s no reason to think he can’t step up a level and combat NFL defensive tackles. He isn’t going to get pushed around and you see good hand placement and leverage. In the USC game (see above) he just looked superb. Time and time again he secured second level blocks to enhance runs downfield. When he needed to match up vs power he did it with ease. It was pretty much a complete performance as BC ran all over the Trojans for 452 yards. Seattle wants good run blockers first and foremost and this just stood out as a great run blocking performance. On this evidence you wouldn’t be surprised if he went in that late third or early fourth round range. I tried really hard to note some negatives but couldn’t really find any. He is a marginal athlete. He ran a pretty awful 5.50 at the combine — the headline of an average workout across the board. Yet on tape you do see that desire to get to the next level and you’re not asking him to win any races. Willingness, technique and execution are the key things here. He’s a fighter who wants to find someone to block — and he knows what to do when he gets there. We do tend to get caught up a little bit in the size/speed/SPARQ angle. The Seahawks love their difference makers but they also like tough, hard nosed players who respond to coaching. Justin Britt wasn’t a brilliant athlete but he was a tough street fighter. The one thing that might work against Gallik is the size — they do like bigger linemen. Britt is 6-6, 325lbs and carries the weight perfectly. Gallik is only 6-2 and 306lbs. In comparison Max Unger is 6-5 and 305lbs. For that reason they might prefer Grassu (a closer size match to Unger) or even a possible tackle convert like Mitch Morse as we’ve discussed previously. Morse is 6-5 and 305lbs and close to Britt. They play with a similar style. It won’t be a total shock if the Seahawks draft Morse — a good athlete — and try to convert him to guard or center. If they can see beyond the size and middling athleticism then Gallik could be in play. The Seahawks do focus a lot on body types and ideals and he might just be too small. He’s one heck of a football player though — a battler, a fighter, a technician and a possible instant starter. One to keep an eye on. Free-agent DE C.J. Wilson visiting Seahawks this week, per source. Wilson is a former 7th round pick by Green Bay in 2010. He’s 6-3 and 306lbs. Although he played end for Green Bay in the 3-4, he’d probably kick inside for the Seahawks. I’m trying to work out whether we can read into the sudden flurry of visits involving defensive players. Ahtyba Rubin signed a few days ago, while Anthony Spencer met with the team recently. They wanted to meet with Chris Canty. Others have been linked too, including Greg Hardy. Perhaps it’s a sign they intend to focus on the offensive line, receiver and cornerback in the draft? They’ll certainly find better value there in rounds 2-4. I think you can find a starting center and left guard. Yes there will be growing pains — but looking ahead you also get two cheap starters for the next four years. I also think you can find one if not two receivers who can contribute in year one, plus some extra depth at corner. It’ll be harder to find defensive talent but there are some options. 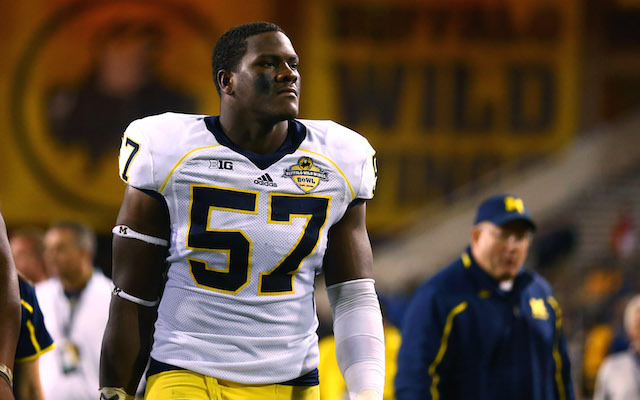 Michigan’s Frank Clark — if you can accept the long list of serious off-field concerns — is a tour de force in the 2013 tape. There are others too with less concerning character issues. Yet it just seems more likely that OL and WR will be the target, with a corner or two added along the way. That might be why the Seahawks are looking at so many different D-line options — and it could lessen the likelihood that Wisniewski lands in Seattle with the cap room ebbing away.